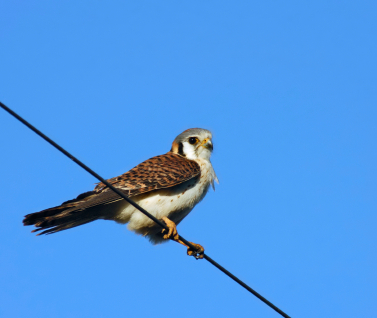 One of our readers sent us this report of her sighting today - When my mother and I were driving south of London today, we saw two Kestrels on the telephone wires on Harry White Drive. I don't know if these birds migrate for the winter, but we saw them last week too. They are probably a pair - when we saw them last week, one of them had a mouse in its beak! Obviously, it had a successful hunt! Today, we saw one of them hovering in one spot, again it was probably watching some small rodent, and was waiting to pounce. Thank you for your report, Bex, I'm not sure if Kestrels migrate south for the winter or not, perhaps one of our readers might have that information and will let us know! Hi there - From what I can find out, the Kestrel is the most common and also the smallest falcon in North America. Some of them live here in Southern Ontario all year round, some of them migrate here from further north, and some go more south. So, technically I guess the answer to your question is "yes" they migrate, but they also live here all year round. Aren't they cute? I just love them! I also love that almost every time I've seen one it hasn't been shy and has hunted right in front of me!